The IBEX 35 is the benchmark index of the Bolsa de Madrid, Spain's primary exchange. This provides more context to last week's move. Last week the Spanish region of Catalonia held a referendum to become an independent nation. The Spanish government declared the referendum illegal, but Catalans took to polls to vote anyway. The referendum became an international controversy after videos emerged on social media showing masked police stealing ballots and viciously attacking non-violent voters. Spain’s prime minister Mariano Rajoy praised the police despite videos of police beating elderly women and firing rubber bullets at people who were simply trying to cast a ballot. Of the ballots that were able to be cast, 90% voted for independence with 43% of Catalans voting. This week I want to take a look at how Catalan independence could become a major market issue. The idea of an independent Catalonia is not a new one, it has been over a century in the making. The stronghold of the Republic was in Catalonia where a coalition of socialists, anarchists, communists and others fought against the fascists and monarchists. People came from all over the world to fight against fascists in the Spanish civil war including authors George Orwell and Ernest Hemingway. The fascists eventually defeated the Republic and Franco ruled Spain as a fascist dictator until his death in 1975. Images of police beating non-violent voters certainly evokes memories of fascism for many in Spain. More recently, Catalans have been seeking independence for several reasons, but we’ll focus primarily on the economic reasons. Catalonia is the largest contributor to Spain’s GDP. Consequently, while Catalonia is only 16 percent of the country’s population they pay 20 percent of the taxes and only get 14 percent back. However, Catalonia is also the largest state contributor to Spanish debt at about 16 percent of Spain’s roughly 1 trillion dollars of debt. This is where things get a little hairy. It is easy to forget that Spain just recently recovered from a debt crisis since their bonds have been propped up by the European Central Bank (ECB). But what happens if Catalonia declares independence? If Catalonia becomes an independent country it will likely not be accepted into the EU because Spain would have to approve that request, something that seems unlikely given the current political climate. The independence vote has scared many banks that had been headquartered in Catalonia out of the region. Banco de Sabadell one of Catalonia’s largest banks has announced that it will move it’s headquarters and CaixaBank was also considering a move. 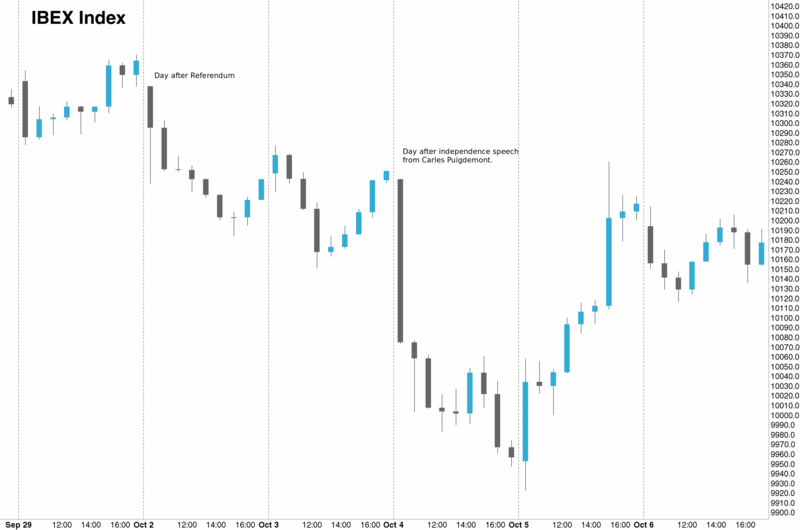 Spanish stocks have been hurt by the recent events shown in figure 1, but these moves are not that significant when viewed from a longer term perspective (figure 2). If these banks remained in Catalonia they would no longer be able to borrow directly from the ECB and would be reliant on other Eurozone banks. These banks are unlikely to move major operations for now, and everything should remain pretty much the same. Another major issue facing Spain is potential downgrades from ratings agencies, particularly DBRS the smaller Canadian ratings agency. They currently have a higher rating than the three big agencies, which allows European banks to use Spanish debt as collateral to borrow at the ECB without undergoing a significant haircut that a one-notch downgrade would bring. DBRS is currently maintaining a stable outlook because of the strengthening economy, but the situation could change quickly. Catalan independence is a very complicated issue and this short post certainly is not enough to cover all of the financial impacts. It will be important to see what happens this Tuesday when Catalan lawmakers meet. The broader global markets do not seem too concerned with Catalonia at the moment, but I think it is a good idea to keep an eye on developments because it could quickly escalate into a more dangerous situation.